This past weekend, hundreds of thousands of people were evacuated in anticipation of a potential spillway failure at the Oroville dam. 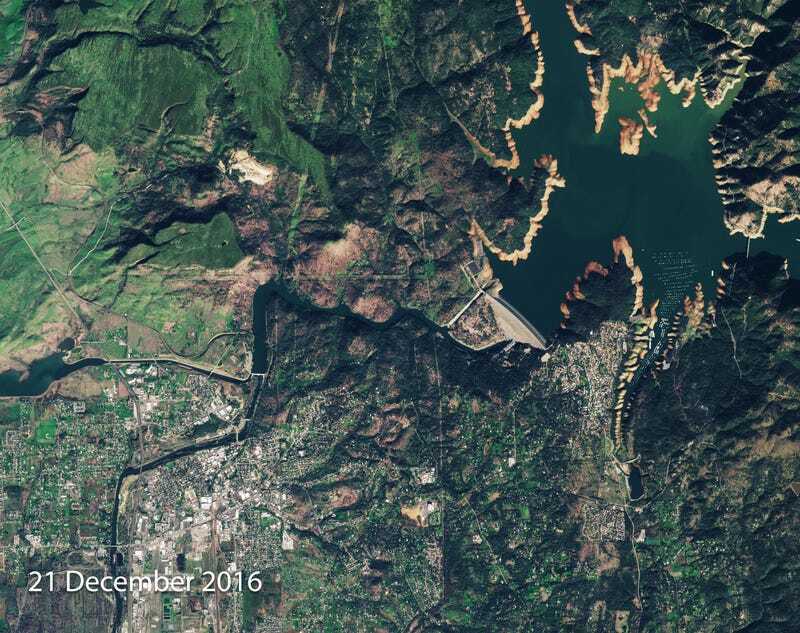 Images from space show what the area in northern California looked like during last year’s drought, and how it appeared after a spate of intense rain, at the height of the recent breach scare. The two images, captured by the Copernicus Sentinel-2A satellite, were taken 40 days apart, and together tell a story of dramatic environmental change. During the drought, vast tracts of exposed shoreline were visible, including a batch of islands just north of the 770-foot (235 meter) dam. But in late January, after heavy rains, the shorelines shrunk, and the islands became submerged. Looking at the animation, the color of the water appears lighter during the drought, but much darker in January owing to sediment washed into the dam. The city of Oroville, home to 16,000 residents, can be seen at bottom left. The images also show the primary and auxiliary spillways at the dam. The animation shows water gushing down the primary spillway, which eventually experienced a failure at its lower levels. 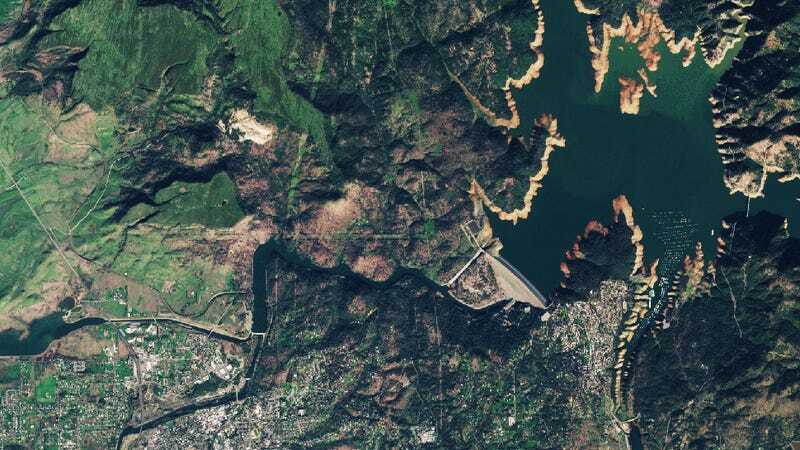 Because the auxiliary spillway had never been used before, and due to the tremendous amount of water spilling into it, officials feared a total collapse of the dam system, resulting in the evacuation order earlier this week. 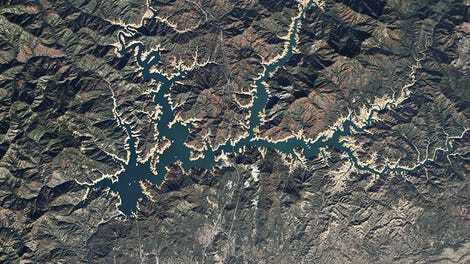 The Oroville dam is one of the 20 largest dams in the world, holding back the second largest reservoir in California. Unfortunately, this crisis isn’t over yet. Officials are now rushing to drain more water from the lake behind the dam as new storms roll in. As many as three storms are expected next week, with the potential to drop as much as five inches of rain in total. Update: The fine folks at DigitalGlobe just sent us some more pics taken at higher resolution. 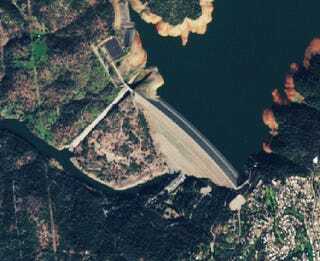 The photos taken before the overflow were captured on August 23, 2016 by the company’s WorldView-2 satellite, and the ones taken during the crisis were were taken by the company’s newest satellite, WorldView-4, on February 14.